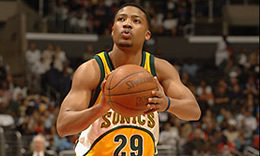 Crossover's current featured athlete, Mike Wilks, has had a very successful professional career for more than ten years. Mike shares a deep passion and love for the game of basketball, but it doesn't supercede his deep love and passion for Jesus Christ. Professional Experience (teams played for): Huntsville Flight (NBDL), Atlanta Hawks, Minnesota Timberwolves, Houston Rockets, Cleveland Cavs, Seattle Sonics, Denver Nuggets, Washington Wizards, Orlando Magic, and OKC Thunder. CI>> When and how did you get introduced to Basketball? Mike>> I was introduced to the game of basketball when I was about 6 years old. I can’t really remember exactly how, but it was either when my parents bought me a small basketball goal, or when I started going to the Boys and Girls club. CI>> Is there a particular player or person that inspired you in your Basketball career? Mike>> There wasn’t just one person in particular, but many. I’ve always felt like I was not just playing for myself, but for my hometown, particularly the neighborhood in which I grew up. That’s why I wear the number 29, which symbolizes 29th Street Playground, which is the park that I grew up playing on. There are so many people that inspired and encouraged me to reach my potential as a person and player. CI>> What platform has the NBA and your professional experience provided for you to spread the Gospel and be a witness for Jesus Christ? Mike>> It has provided a major platform. So many kids look up to pro athletes, and are influenced by how we live our lives. People respect the fact that you have been able to make it to that level, and thus they are willing to listen to what you have to say. I truly believe that God allowed me to make an NBA team year after year for the very purpose of using it as a platform to share Him with others. Because I’ve played in the NBA people have invited me to speak at various venues, such as camps, schools, and churches, which gives me the opportunity to testify about the goodness and power of the Lord. Also, because I’ve played on so many teams, I’ve had the opportunity to encourage other pro players in their faith walk as well. CI>> What are your goals in using Basketball in the future? Mike>> Once I’m done playing, I’ll probably continue to host and work camps for kids. I plan to continue using basketball as a tool to teach and build character in young people. I’m also on the board of an organization called Basketball Club International (BCI), whose mission is to provide resources and support to pro basketball players, encouraging them to grow in their faith and role as leaders. CI>> What are your thoughts of the ministry of Crossover International? Mike>> I think that the Crossover ministry is awesome and is doing a great work for the Kingdom of God. I’m inspired by how Crossover is using the game of basketball to make disciples, cause positive change in the lives of young people, and spreading the gospel to the uttermost parts of the world. CI>> How has your relationship with God been significant in your basketball career and in your life? Mike>> God is the great I AM. Whatever I have needed, He has been that for me. I can’t imagine life without Him. God has been my strength when I’m weak, my hope in times of despair, my protector, provider, redeemer, etc… I can go on forever. God is my source, and therefore I know that I must stay connected to Him. My faith and relationship with God influences and impacts every area of my life. CI>> What life lessons has God used basketball to teach you that you can pass on to aspiring kids? Mike>> With God, anything is possible. God created you for a purpose. Whatever God has called you to do, He will give you the grace, ability and provision to fulfill your purpose. It doesn’t matter what people think, God has the final say. Seek/Put God first, and He will use you in ways you’ve never dreamed. Bible Story: The life stories of Joseph and David.